Champagne Going Down...: What's in a name? Little children are great. They have absolutely no sense of politeness and what is PC (politically correct) or not. There is a lady in our neighbourhood who is a double XXXXL. I suspect it is some kind of decease, but I don't really know. It is not as if you can just go up to her and ask, "why are you so fat? ", or can you? Our three year old wil stare at her and ask, "Why is she fat Mommy?" Yesterday we went to a cafe for lunch, and a little kid was sitting at the table next to us with his parents. Little boy, "What am I having? ", Daddy, "You are sharing Mommy and Daddy's sandwiches", Little boy, "but I want my own! "....in steps Mommy, "There is lots of food coming. We will all have our own". Two plates arrive, and the Mommy gives the boy some of her sandwich, "this is your sandwich". And the boy is happy. The name you give things can be very important. Just look at PwC when they tried to rename to 'Monday'. Monday representing a new start to a week, something fresh. 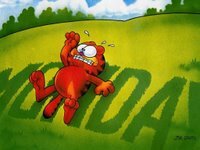 I guess they forgot that most people are more likely to agree with Garfield when it comes to the Mondays; "I hate Mondays".